DJ's Book Corner: DeeJay Reviews: Nero's Fiddle by @AWExley + a TOUR GIVEAWAY! 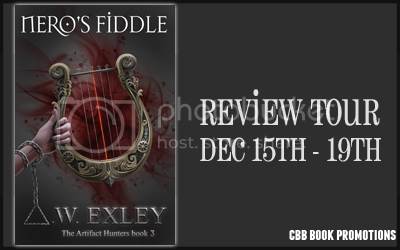 DeeJay Reviews: Nero's Fiddle by @AWExley + a TOUR GIVEAWAY! Source: Received from author and CBB Book Promotions in exchange for an honest review. One death by spontaneous human combustion is a rare act of God. Two... is surely a freakish coincidence. Three... well, that's starting to look deliberate. 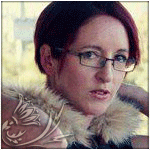 Cara has a new role as Queen Victoria's artifact hunter, she's adapting to married life and living in a country manor that more closely resembles a mausoleum. In London, Inspector Fraser investigates a series of strange deaths by divine fire - except he doesn't believe in coincidences. Despite himself, he enlists Cara's help to identify what artifact could cause such a hideous death while his desire to bring her husband to justice burns unabated. Someone's intent on making sure a decades old secret stays hidden and Cara must figure out who is responsible before this case consumes her family and rocks the entire realm to its foundations. Nefertiti's Heart introduced me. Hatshepsut's Collar entertained me. Nero's Fiddle? Enthralled me! Don't get me wrong. The first two books were great, but this one really did it for me. There wasn't as much adventure as Hatshepsut's Collar, but the mystery and intrigue were CRAZY. I adored the twisty plot with all of its hidden secrets and flashbacks. Every word written added to the story and the author didn't waste any time by going off on worthless tangents. Cara and Nate were just as wonderful to read about as they always are. Nate becomes a bit more whipped every book, but I think it's cute. At his core, he hasn't lost his edge and will take down any threat to himself, his empire, but especially, Cara. You can't help but love him. Cara is as wild and crazy as she's always been, but she's learning to play the game. She can strut her stuff out there with the ton, but she'll also put on a pair of pants and get the dirty work done. Love her. Nan and Nessy continue to be a hot mess, but I loved how Nero's Fiddle dove into their pasts and unearthed secrets that we never see coming. Cara's own past is starting to make a lot more sense to me now, though I know there's still so much more to learn. As for Hamish Fraser...I get where he's coming from, but I also think he's a douchebag. It's only right to want to avenge someone you love, but Fraser is dealing with Nathaniel Lyons, and though I feel Fraser's pain, I'm rooting for Nate. We'll see how this pans out in the next book. As for the plot itself, fantastic. It was another great artifact, the best yet in my eyes, and the road to solving the mystery was perfectly mapped out. I loved the ride along and witnessing Cara and Nate's love for each other grow so much stronger along the way, was the icing on the cake. Overall, another great Artifact Hunter's book with a satisfying amount of Steampunk elements. The first book was a little light on the Steampunk fun, but not this one. It was all there and more. I would highly recommend this series and I am super excited for the next book! Awesome review!!! I'm so glad you really connected with this and loved it! Thank you so much for hosting a tour stop and sharing your thoughts! I enjoyed this series too. Each book is so individual that I couldn't pick a favorite though the second book really blew me away.